you must ensure that your initial wager is divisible by three and must distribute your wager equally between the three betting spots. The symbols “1” and “2” indicate the thirds of the wager which you can withdraw before the first and second community cards are turned up. The “$” represents the third of the wager which can never be withdrawn. 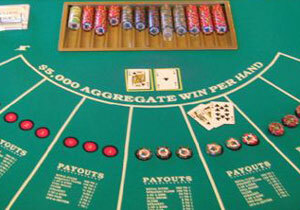 To start the game, a player places three equal bets in each circle. The Shuffle Master machine deals out cards three at a time. The dealer places the three-card hand in front of each player. After each player receives his or her cards, the dealer discards one card, leaving two cards face down in front of the dealer. The machine counts out the remaining cards into the discard tray. When this is finished, the players are allowed to look at their three-card hand. You now have the option of withdrawing your second bet or “letting it ride”. (You may withdraw the second bet, even if you let the first bet ride. However, you can not withdraw or put the first bet back up. Would you like more information on Let It Ride poker? 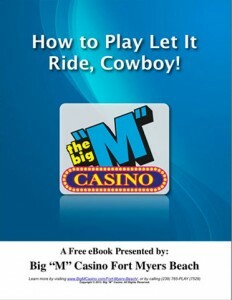 Download our FREE ebook: “How to Play Let It Ride, Cowboy!“ today! Time to make your online reservations for one of our daily or evening cruises? If your party is 10 or more, we offer group rates with advanced registration! The Big “M” Casino Cruise departs from Moss Marine, Fort Myers Beach. Have questions? Contact us online or call us at 239-765-PLAY (7529), we’ll be happy to answer them. Follow us on Twitter, and LIKE us on Facebook.